Full disclosure, I was provided a copy of this book by the author however have voluntarily chosen to write a review. All opinions are my own. Set in modern day San Francisco, “The Prophecy” is the story of Tasia Armstrong, who is currently living in the city under the guise of a low-level wizard. Always looking over her shoulder and taking great pains hide her secret, Tasia scrapes by with whatever jobs she can get, including the occasional magic gig more suited to a wizard of lesser prowess. As the daughter of two powerful magic users, Tasia has also inherited considerable power from both parents and it has been through her father’s efforts that her existence is a carefully guarded secret. As such, she must hide out in plain sight for fear of the repercussions that her existence may bring. For the most part, Tasia has been doing very well blending in and escaping notice, but that all changes when a side magic job ultimately leads to her discovery of a captive Shifter. From the moment she comes to Hawk Manotti’s aid, Tasia’s world is turned on its side as she finds an easy friend in the Shifter and his twin. Unfortunately, Tasia being in the right place at the wrong time has also caused her to become the target of more scrutiny and attention than she ever wanted. The San Francisco area is experiencing a rash of muggings of low level female wizards in the area, of which Tasia’s cover would fit the profile. After Tasia barely escapes an attack of her own she is forced into an unlikely alliance with the Northern California shifter pack. 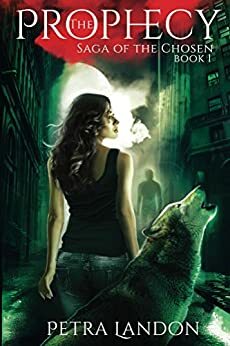 As a guest of the Alpha Protector and under pack protection, Tasia takes up a tenuous residence at the Lair and begins to assist the Alpha and his pack with an investigation into a decades old event. A powerful witch named Lady Bethesda broke into the magical vault in New York 24 years ago died shortly thereafter. The pack, at the request of the Wizard and Shifter heads have been tasked to try to piece together Lady Bethesda’s movements prior to her death and more importantly determine if the sorceress somehow survived the blast that killed many that day. The more the pack discovers with the help of Tasia, the more curious the mystery becomes. As the threads start to unravel, Tasia wonders if she will ever be safe again. First off, I must say that the above synopsis doesn’t even compare to all the action that is in this book! Being the first in the “Saga of the Chosen” series of books by Petra Landon this a great introduction into the world of the Chosen. Tasia’s San Francisco is full of Shifters, Vampires and Magicks of all type with a unique culture and political structure for each faction. Told primarily from Tasia’s point of view she finds herself navigating quite a few sticky situations as she attempts to adjust to life in the Shifter pack with its many traditions and idiosyncrasies. In a world where Chosen factions tend to keep to themselves and not willingly associate with the other groups, the dynamic Tasia has with the Pack and their Alpha is curious at best and scandalous at worst. Tasia finds herself running afoul of the Alpha Protector more times than she would like, but is inexplicably drawn to him. The budding dynamic between Tasia and Raoul reminds me of a plot of an old school romance novel where no matter how hard the macho lead tries to resist, he falls for the heroine despite himself. If there will be romance in the cards for Tasia and the Alpha Protector is a topic for another installment in the Saga, but for me the seeds are definitely there! Overall “The Prophecy” is a fantastic story – a classic take on the Urban Fantasy with a fresh new twist and I am looking forward to seeing all that this series has to offer. My name is Shaun and I’m an author, just wondering if you would consider reviewing my book in exchange for a free ebook copy? Thanks for taking the time to consider my enquiry, and I look forward to hearing from you soon. Hi Shaun. I checked out the link for Ewan Pendle and this definitely looks like something I could get into. I must warn you though that you will be #7 on my “to read” list, but if you don’t mind waiting, please send over a copy. .mobi is preferred but if .epub is all you have, I can convert it. You can send the file to jennly@tooker.us This is the best way to contact me although twitter is also good as well.